Background: Exposure to indoor air pollution, in particular particulate matter from biomass-fueled fires, has been identified as a major public health problem. Here, we test the effectiveness of simple ventilation systems in reducing concentrations of particulate matter in a standard experimental kitchen, built of traditional materials in Kenya. Materials and Methods: Continuous sampling for total particles, particulate matter <10 μm and <2.5 μm were sampled in a purpose-built rural kitchen using four ventilation scenarios: no ventilation, open window, open window and chimney and chimney only. The levels of pollutants were recorded and the effectiveness of different ventilation scenarios in reducing the exposure was compared. Results: For each size of particle, any type of ventilation showed a decrease in concentrations (P < 0.001), compared to the unventilated scenario of 70% or more. The lowest concentrations were observed when only a chimney was used; opening a window did not significantly alter the effectiveness of the chimney. Additionally, the changes in pollutant levels over time showed the least variation and lowest mean values when a chimney only was used. Conclusions: Simple ventilation systems, especially installation of a chimney, proved to be effective in significantly decreasing the exposure to biomass fuel-related indoor particulate matter exposure. The application of such technology may help in tackling this important public health issue. Context: Giardia lambia is a common intestinal protozoon with a higher prevalence rate in tropical countries as compared to the Western world. Histological changes occur in duodenal mucosa in cases of chronic giardiasis that may be similar to celiac disease or tropical sprue. Aim: As the prevalence of giardiasis is high in our country, the present study was undertaken to study the changes in duodenal mucosa of patients with asymptomatic giardiasis and endoscopically normal duodenum. Study Design: The study included 47 duodenal biopsies out of 372 total cases of endoscopic biopsies examined, in which trophozoites of Giardia were identified. A detailed histo-morphological study of these cases was carried out and the histological findings were evaluated. The major histopathological features as observed in cases of giardiasisi.e inflammation, increased intra epithelial lymphocytes (IELs) and villous abnormalities were compared between patients without giardiasis and those with giardiasis. Statistical Analysis Used: P-value using chi-square test was calculated. Results: P-value was found to be significant for inflammation and villous abnormalities whereas increased IEL's were found to be an insignificant histological parameter. Conclusion: Although the histological features associated with giadiasis were non-specific, a higher incidence of villous changes with increased IEL's was found. This study highlighted the importance of identification of Giardia trophozoites in duodenal biopsies to avoid misdiagnosis of celiac disease or tropical sprue which may have similar clinical and histological features but have different management strategies. Context: India has the highest tuberculosis (TB) burden in the world in terms of the absolute number of cases that occur each year. The directly observed treatment, short-course (DOTS) strategy is the most systematic and cost-effective approach to controlling this disease. Furthermore, understanding the specific reasons for treatment outcomes is important for the improvement of treatment systems. Aims: This study aimed to determine certain sociodemographic factors that contribute to TB treatment outcome. Settings and Design: A prospective study was conducted among 302 TB patients at four designated microscopy centers (DMCs) of Aligarh District, Uttar Pradesh from April 2012 to June 2013. Materials and Methods: Study subjects were followed up from the initiation to the end of treatment. Baseline data were collected using a pretested questionnaire. The subjects were interviewed at least 3 times each during their treatment. Outcomes were considered as per the Revised National Tuberculosis Control Programme (RNTCP) standard definition. "Cured" and "treatment completed" were considered good outcomes, while "default," "failure," and "death" were considered poor outcomes. Statistical Analysis Used: Data were analyzed in SPSS 17 using the chi-square test and univariate logistic regression to determine the association. The odds ratio (OR) and 95% confidence interval (CI) were calculated in logistic regression. Results: The majority of the subjects were male (72.2%) and in the age group of 15-30 years. Among the subjects, 53% resided in urban areas; 63.6% were literate; and 45% had a high standard of living index (SLI). Age group, literacy status, and SLI were found to be significantly associated with outcome (P < 0.05). On logistic regression, the 31-45-years age group, literacy, and high SLI were found to be significantly associated with good outcome. Deviations from the norm such as multiple orifices, apical deltas, accessory canals, and other variations are frequent in the roots of the posterior teeth. 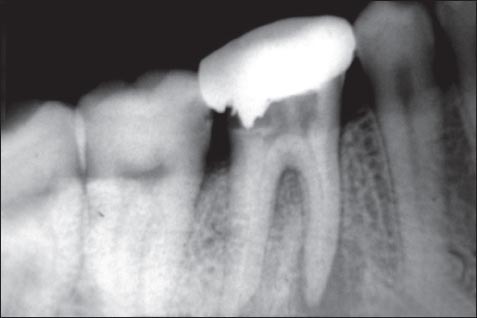 Two clinical reports of mandibular molars are presented in which three canals in the mesial roots were treated endodontically. Review of the literature encountered a prevalence ranging from 1% to 15%. Clinically, the third canal is difficult to find and exhibits a very variable morphology, which may present anastomosis with the other canals. Toxoplasmosis is the most serious manifestation of infection, resulting from the vertical transmission of Toxoplasma gondii (T. gondii) transplacentally, from a parasitemic mother to her offspring. It could also be acquired. Case Presentation: E.B is a 17-month-old female baby who presented with recurrent fever x 16/12., chronic cough x 16/12, recurrent stooling x 15/12, recurrent ear discharge x 15/12, failure to gain weight x 15/12, and delayed developmental milestones. Examination revealed an acutely ill- or chronically ill-looking child in mild respiratory distress, afebrile (36.5°C), anicteric, acyanozed, moderately pale, well hydrated with generalized lymphadenopathy (axillary, inguinal, cervical), no digital clubbing, and no pedal fullness. Computed tomography (CT) scan revealed bilateral basal ganglia calcifications with a focal cystic area in the left basal ganglia; bilateral multifocal intracerebral hypodensities were noted from the frontal to the occipital lobes at different levels bilaterally, with calcifications limited to the basal ganglia. Serological test revealed the patient's serum to be positive for toxoplasma immunoglobulin G (IgG). Conclusion: Toxoplasmosis, though rare, can cause mortality and morbidity in children. Thus, a high index of suspicion is warranted in management.